One of the biggest changes of the past few years is the growth of tankless, or on-demand, water heater options available to owners of homes and buildings. Today, tankless water heaters are an affordable, high performance alternative to other options such as traditional tank water heaters or boilers. 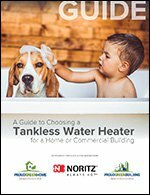 This guide will help you understand the world of tankless water heaters and the advantages that they provide to homes and buildings. If you've never experienced life with a tankless water heater, it opens up a whole new world of comfort and energy efficiency.